I just finished reading a book by Nabeel Quereshi called, “Seeking Allah, Finding Jesus”. What an fascinating book. I was drawn to this book due to the saturation of Islam in the news. Sadly we are seeing radicals rise up and destroy the lives of followers of Christ, Jews and anyone who does not follow their ideology, all over the world right now. Nabeel’s story provides a glimpse into the life of a moderate Muslim who was not bent on destroying others. It takes the reader from his early years to his journey into become a follower of Christ. I read this book hoping to understand the ideology of Islam a little better and to understand the Muslim people a little more. I believe it accomplished both. I don’t want to share much here about the book in hopes that many of you will read it for yourselves. Though I speak out against the slaughter of Christians, Jews and non radicals, sign petitions and support those ministries helping those suffering at the hands of radicals, I now have a better understanding of what they believe and why they do some of the things they do. I am now more than ever determined to continue to pray for their eyes to be opened to the truth of Jesus Christ. It is only through Christ that they will ever truly discover peace and be able to lay aside their indifference to hatred of anyone that does not follow their ideology. Though the atrocities being committed today in the name of Islam are horrific, we must pray for the persecutors. There was a time when Apostle Paul persecuted the Christians and we all know how God was able to turn him around to not only follow Christ but to become one of the greatest followers of Christ to date! It is critical that we speak out against the atrocities but it is also imperative that we pray for the Muslim people to have a revelation of Christ. Nabeel’s story illustrates the importance of Christians not hardening their hearts to non believers but instead, to pray for and sensitively speak the truth whenever the opportunity presents itself. I was so encouraged by his Christian friend David, who continued to pray for him and share the gospel with wisdom and sensitivity over the course of several years. Too few of us are willing to invest the time and prayer into those who don’t quickly convert. 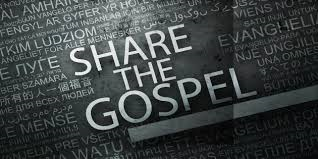 We are all called to share the gospel. We may or may not see quick results. We may never see the results but we who are redeemed have the answer to those seeking! We are called to share the good news with others! My prayer is that we will be willing to invest the time it may take to get to know others and speak truth into their lives. To pray and continue to pray for those who are blind that they may have their eyes opened to the truth of the gospel. The good news is the only solution to what ails the world! Without each of us praying and sharing the gospel, multitudes will be eternally lost! Lord, please help each of us to serve you with abandon. Help us to use each opportunity you provide to give the good news to people desperate to know You. Remind us to hold in prayer those whose eyes are blinded by deceit that they may have their eyes opened and their hearts opened to the gospel. Give us the perseverance we need to not give up easily on those who you have put in our lives to share the gospel with. We ask it all in the beautiful name of Jesus, our Savior and Lord, Amen. ← Are you worried? Here’s your answer!